You have a great smile: beautiful white teeth all perfectly aligned. 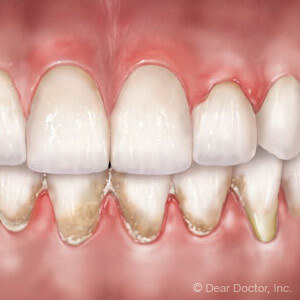 But unbeknownst to you, periodontal (gum) disease might even now be damaging your gum tissues, setting the stage for future tooth and bone loss — and a ruined smile. While it’s easy to miss the early stage of this disease caused by bacterial plaque on tooth surfaces, there are a few signs if you pay close attention. Bleeding gums after moderate brushing or flossing could indicate normally resilient gum tissues have begun to weaken. You may also notice a slight redness and swelling around the margins of the gums and a bad taste or breath. As it progresses, you may experience painful abscesses (infected pockets that develop between the gums and tooth) and loose teeth, a late sign of tissue detachment and bone loss. If you are a smoker, nicotine reduces swelling and bleeding of the gums, removing signs you have a disease. If you smoke, you need to see your dentist regularly. While renewed daily oral hygiene is important for stopping gum disease, you may also need professional care to bring it under control. The main treatment calls for the manual removal of plaque and calculus (hardened deposits of plaque) that are sustaining the infection. Dentists and hygienists both can perform scaling, which removes plaque and calculus at or just below the gum line, and root planing to clean accessible root surfaces. In more advanced cases, though, you may need the services of a periodontist, a specialist in treating diseased or injured gums, bone and other connective tissues that support the teeth. They’re also skilled in more advanced treatments like gum flap surgery that more fully exposes a tooth’s root area for plaque and calculus (or tartar) removal, or tissue grafting procedures that improve the health and appearance of damaged gums. If you suspect you have gum disease, the place to start is with your family dentist. They can determine if your case will respond to basic scaling, root planing or antibiotic treatment. If the disease appears more advanced or with complications, they will most likely refer you to a periodontist for treatment. If you’ve already seen bleeding, swelling or redness, see your dentist as soon as possible. The sooner you begin treatment for any case of gum disease, the less likely it will lead to the loss not only of your teeth but your beautiful smile.